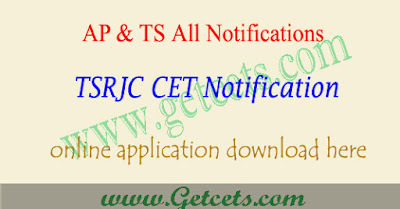 TSRJC 2020 notification, tsrjc cet application form : The Telangana State Residential Junior College Common Entrance Test TSRJC CET Notification 2020 will be released in the month of March by the TREIS on behalf of Telangana State Govt. It has invited tsrjc applications from from the eligible candidates who seek admission into Regular 1st year Intermediate courses for the academic year 2020-21. 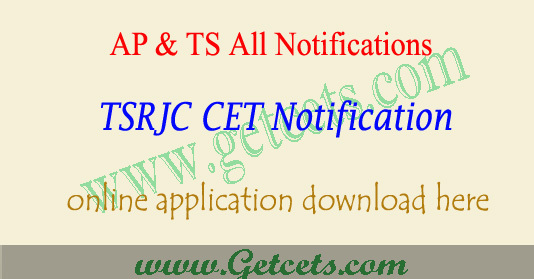 TSRJC 2019 notification released on 26 February. TSRJC 2019 online application start from 12 March. Last date to submit online application is 11 April . Eligible candidates can apply tsrjc to get admission into intermediate course in residential junior colleges in Telangana. Candidates can see below about tsrjc notification, online application, syllabus, exam date and other details. Candidates must be Indian National. Must have studied in Telangana state. Candidates appearing tenth class exams are eligible. Candidates must have passed SSC 2019 in first attempt in addition to that candidates secure minimum GPA 6. In case of SC/ST/BC/Minority candidates can secure minimum GPA 5 and All candidates must secure minimum GPA 4 in English. From the candidates who are appearing for 10th Class March 2020 examinations from 31 Telangana Districts for the academic year 2020-21. Candidates can apply through ONLINE at tsrjdc.cgg.gov.in. TSRJC exam conducts in all district head quarters, so candidates can choose their exam center according to their possibility. Tsrjc exam conducts for 150 marks and question paper contains 150 question. Each question carries one mark and there is no negative marks, So candidates can answer all questions even they don’t know.